Some of our sailing adventures in Crab were in the tracks of the famous triremes. In classical times, these were the most advanced warships of the day. 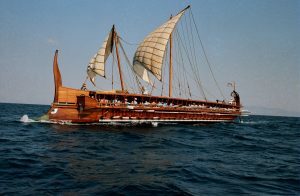 So I was fascinated to read more about the Trireme Trust and the Hellenic Navy‘s reconstruction and trials of trireme Olympias as a modern reconstruction of a boat once known across Greece, Italy and the Mediterranean. Many people thought classical historian Thucydides was exaggerating. Could 170 rowers and three tiers of oars work in unison? The sea trials, just like our trials in Bosphorus in Crab, proved that the ancient Greeks were extremely capable. Olympias is the only commissioned trireme in a modern navy. She was built May 1985 to July 1987 by a shipbuilder in Piraeus, financed by donors including trireme enthusiast Frank Welsh and the Hellenic Navy, which has also supervised repairs, looks after the trireme and provides its port. There were several sea trials, including one in 1987 where the crew were volunteers – 170 oarsmen and oarswomen. It reached a speed of 9 knots (17km/hour) and could do 180 degree turns in 60 seconds in an arc of 2.5 ship lengths. Given the inexperience of the crew, this suggests the stories by Thucydides were not exaggerations. It has two large square sails. The bow ram is made of bronze and weighs 200kg, a copy of an original in the Piraeus museum. Apparently an trireme could have managed a ramming speed over 16 knots (30km/hr). The original would have carried 10 hoplite soldiers with spears, and 4 archers. The keel of Olympias is iroko, the ship is built of Oregon pine and Virginia oak. 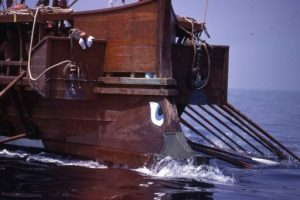 Triremes were built with closely spaced and pegged mortise and tendon joints. They have hypozomata bracing ropes which run from bow to stern under the deck. The modern builders could not get the flexibility of hemp ropes, so they braced with a steel cable, which may break and endanger the crew. Olympias is based in dry dock in Palaio Faliro port. Naval architect John F Coates developed the drawings in discussion with historian J. S. Morrison (after the longest correspondence on any subject in The Times in the 1980s), with advice from Classics teacher Charles Willink, drawing on evidence gained from Greek literature, history of art and archaeology above and below water. It was funded by the Trireme Trust, set up in 1982 “to investigate a centuries-old controversy about the nature of the trireme, the most important warship of the ancient Mediterranean world.” Details of the design work are at the River and Rowing Museum in Henley, where you can also sit in the same rowing set-up. Figuring out the three-tier rowing system was a huge challenge – rowing it was an even bigger one as you can see from these photos of the concentrating faces of the port-side rowers and port-side oars in unison on pages 6 and 7 of the Trireme Trust gallery. On reflection, sailing an open lifeboat, whatever the dangers, was probably easier than travelling by trireme. This article (http://www.cornellcollege.edu/classical_studies/ariadne/images/ch15.shtml) on the Cornell College website, describes the battle tactics of the triremes at the Battle of Salamis, where they sank or took control of 200 bigger Persian warships and killed tens of thousands.